Since it’s #VolunteersWeek 2017, Bill Graham from New Wortley Community Association in Leeds, reflects on his experience as a volunteer in community businesses, and the world of possibilities that volunteering opens up for individuals to make meaningful change in our communities. Community businesses rely on lots of stakeholders to run successfully. But surely the most important must be the volunteers who help in so many ways. Anyone can become a volunteer, whether you are taking a break from employment but looking to contribute your knowledge and skills to help your community, or you’re young and looking for credible work experience to open doors to employment. Often you find the people who get involved in volunteering are involved in other projects as well, as this keeps your mind and body active, keeps you in contact with people and gives a very real sense of worth. If you are not involved locally I would ask you to reconsider! 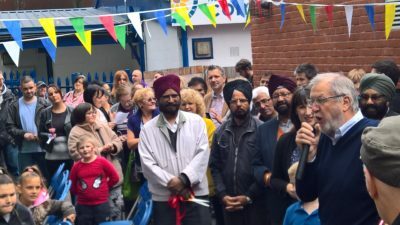 I work as a community leader for New Wortley Community Association in Leeds, but at the last count in addition to paid hours for the association, I will have volunteered an additional 16 hours per week which amounts to roughly 900 hours a year! I don’t begrudge the time – I volunteer to do this as I believe passionately in the project, the work we do and the people we help and work with. In addition to my work there, I am the volunteer treasurer at Bramley Baths -a successful community business based in West Leeds and I volunteer to coach and manage a youth football team. I get so much from all these roles – they keep me in touch with my community, and involved at the heart of decision and policy making. All of my voluntary roles give me transferable knowledge and skills that help me across my roles. Not to mention, the networks you can build up are incredibly valuable. I know an ex-MP who is on so many committees for community groups and charities, that he works harder now than when he was in Government. And through these voluntary roles, he is also asked to speak both nationally and internationally. He is so active and fit it’s difficult to believe he is approaching 70. Even at a successful organisation like New Wortley Community Association, we can struggle to get volunteers for key roles. Our post of Treasurer is still vacant, and this is a role that community organisations often struggle to fill. So, if financial skills are your thing, they’re in demand by community businesses. Please get in touch if you have a couple of hours free to share your knowledge with us at New Wortley Community Association. Volunteering is not for everyone, but if you’re looking to get involved where you could make a positive contribution, a few hours at your local community business can open a world of possibilities – friendships, opportunities, responsibility, a feeling of being valued and valuing something close to you in your community. At a time of great change and flux, volunteering offers you the chance to decide what happens at a local level, in our own community and build useful networks while doing so. I was in a meeting last night discussing Community Housing and a firebrand community activist made the key point, “well if we don’t do it then you can be sure the Government or Council won’t!” Today its incumbent on us – the people – to get involved and make the changes we want to our place, our community and our country. Find your local community business on our map, and find out volunteering opportunities are available to you, to make real local change.